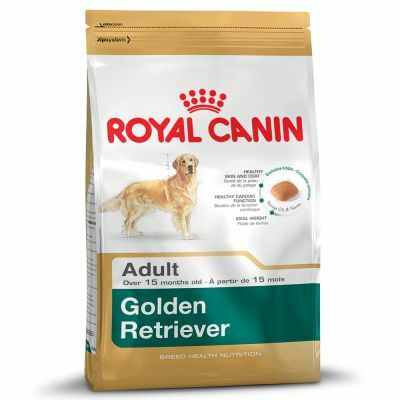 Royal Canin Golden Retriever Adult dog food has a wide range of benefits. Large bags for sale at some of the cheapest prices online. Intensifies the softness and shine of the Golden Retriever's coat through the synergistic action of borage oil and biotin. Helps maintain the Golden Retriever's ideal healthy weight through an exclusive formula and kibble. Maintains vitality with a powerful complex of antioxidants. dehydrated poultry protein; maize; rice; wheat; animal fats; vegetable protein isolate*; hydrolysed animal proteins; vegetable fibres; beet pulp; fish oil; minerals; soya oil; dehydrated tomato; psyllium husks and seeds; fructo-oligo saccharides; hydrolysed crustaceans (source of glucosamine); borage oil (0.1%); green tea and grape extracts (source of polyphenols); marigold extract (source of lutein); hydrolysed cartilage (source of chondroitin).